The sushi just travels on plates around the restaurant until a diner picks it up. On Sunday evening, after a grueling two and a half hours on the soccer pitch, we went out with our good friends the Mitchells (Chris, Saori, Kazuma and Saya) for a special meal at a Kaiten Zushi restaurant. Kaiten Zushi is sushi served not by hand, but by a conveyor belt that circles the restaurant. As in most sushi restaurants, the sushi chefs are visible from almost all locations – at the bar and at the booth – but they focus on the production at this type of restaurant. The restaurant, called Pintokona, is located in the basement of Roppongi Hills. At the bar, you can keep your shoes on, but if you sit at a table, you need to remove your shoes on the tatami and put them in conveniently placed lockers at the front of the shop. You put in your shoes, then take your key for safekeeping, thus ensuring that no one steals your shoes. right away. 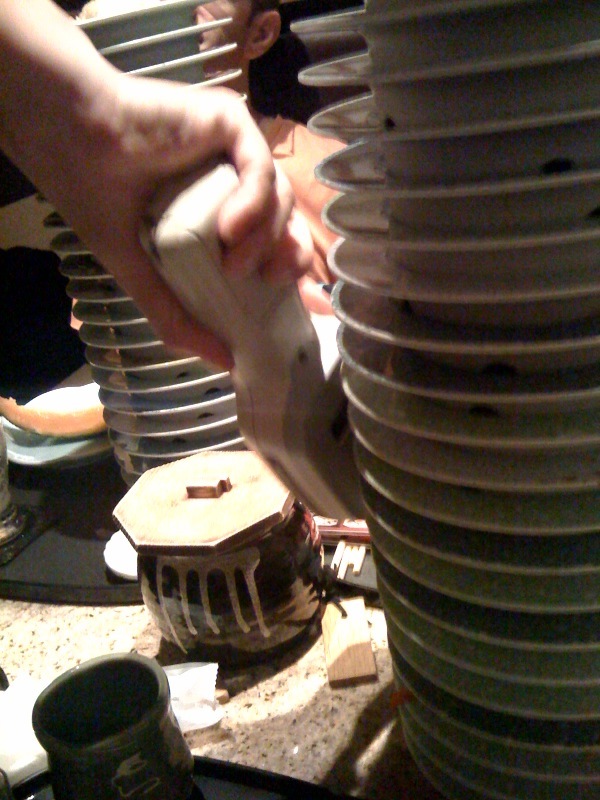 Bailey and Sydney immediately started pulling plates of shrimp (nigiri style – raw over a bed of rice) off of the conveyor belt for themselves and Kazu and Saya. We had to slow them down a little bit – the four kids wanted everything! when the waitress came around, Chris and Marc had a beer and Saori and I had our favorite: plum wine. The kids stuck with tea and water. If we did not see what we wanted, we had two choices. 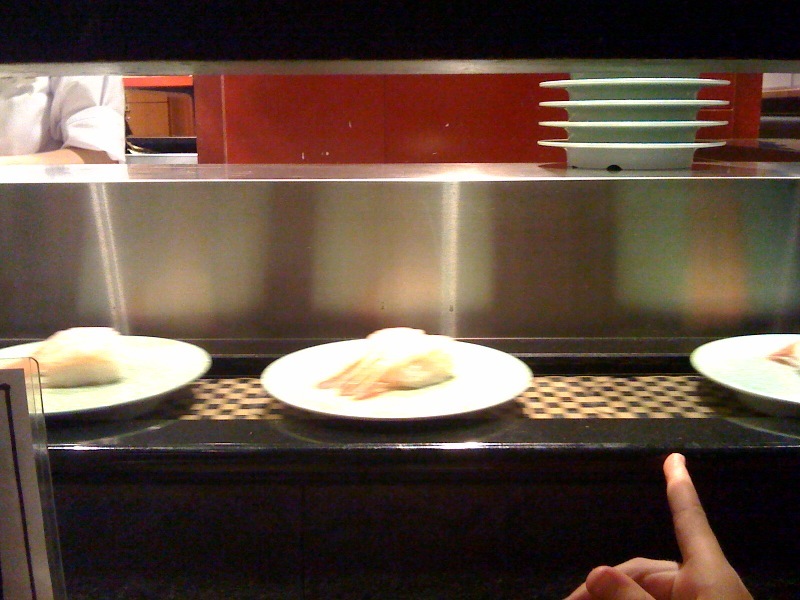 We could either wait until we noticed a waitress, or we could shout through, over the conveyor belt, to the sushi-chef behind it. The kids, predictably, opted to shout out to the chef precisely what they wanted, so it appeared through our little “window” in seconds. With the conveyor belt, there’s always a concern about freshness – how long is that fish on that belt anyway? But here’s a quote from Bento.com about Pintokona: “A modern conveyor-belt sushi shop with a high-tech element – an electronic chip in each plate keeps track of freshness, and fish is taken out of rotation after thirty minutes.” I am not sure how other shops keep track of each plate, but this place is great about it. We ate pretty typical sushi – all nigiri style: maguro (tuna), salmon, eel, fatty tuna, and then some tekkamaki – tuna rolls. The magic wand goes up the stack! her magic wand machine from the bottom of the stack to the top. Then she is able to read the machine and print out an exact bill for us to take to the front to pay. Many places have the old-fashioned counting method, but this is high tech and super accurate. And interesting to boot! Who knew it could be so authentic? There is something similar in the middle of Tyson’s mall. A friend took the girls one night for dinner. You wouldn’t believe how much food they put away. Then again, maybe you would!